The new DaVita World Headquarters is a striking 14-story building located adjacent to the Millennium Bridge at the north end of the 16th Street Mall in downtown Denver. The streetscape design is an extension of the distinctive 16th Street Mall Paving pattern, with the additionof natural wood, stone and native grasses to soften the urban setting. DaVita's distinguishing landscape architecural features include a plaza and two outdoor terraces, one of which is Denver's largest at 5,017 sq ft, offering trees, a kitchen garden, outdoor dining and comfortable lounge seating surrounding a fire pit for employees. 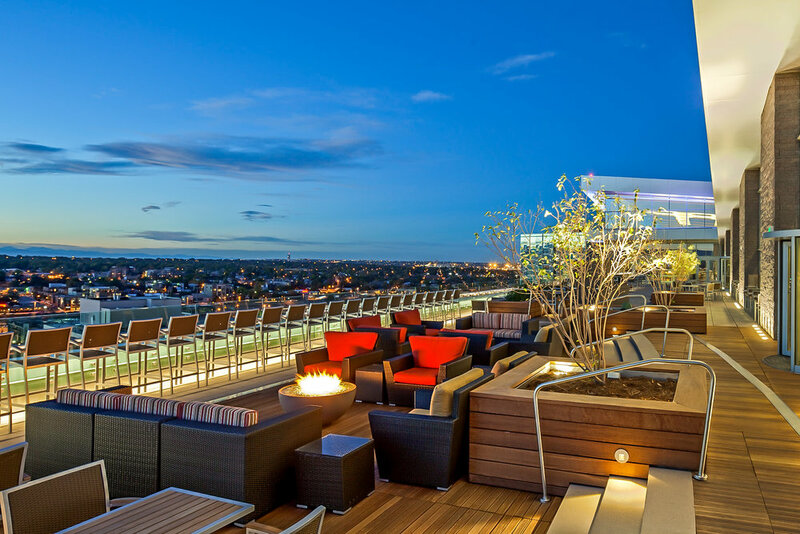 The studioINSITE-designed terrace provides some of the best panoramic views of the city and the Front Range.